Eight-ball is a challenge when the rules and conditions are right. Coming from an English 8-ball background, I�ve always thought 8-ball was a great, difficult game�when played with the proper rules. I think the recent World Pool Series 8-ball event in New York was an eye-opener for a lot of players. Not many players practice 8-ball because they think it is an easy game. But when rules (like breaking outside the box and having to accept your suit on the break) and conditions (like tight pockets on a big table) make the game more difficult, it�s a great challenge. It forces you to be creative, to think ahead and to play proper patterns. For starters, breaking outside the box makes it difficult to make a ball on the break. And using a traditional triangle means it is tough to get a really tight rack, so you end up with a lot of clusters and balls along the rails, which makes for tougher layouts. It also promotes the big, power break, which is always great in pool. The keys to 8-ball � and this goes for all levels of play and all formats � are smart safety shots, a good cue ball and solid patterns. I managed to reach the semifinals in New York, despite not having practiced much and never really feeling comfortable with the break. And I didn�t feel like I was strong with my cue ball. I succeeded, however, because of my pattern play. I simply didn�t have to make a lot of tough shots, which is what proper pattern play allows. What are the keys to proper pattern play? The key in 8-ball is working backwards from the 8. The most important thing is to find your key ball for the 8 ball. You have to start with a solid plan or more than half of the time you�re going to be dead. Next, you need to recognize the problem areas and attack those immediately. I saw a lot of players pocketing two or three balls before attacking a cluster. Big mistake. If you leave problem balls for later in your run-out, you�re asking for trouble. You have to have an insurance ball when you play into a cluster, otherwise you�re in big trouble if you don�t land perfectly on the ball you broke out of the cluster. I saw a lot of players get lost halfway through the rack. At the higher levels, once you�ve pocketed half of your suit, you�d better be able to finish the run-out. That is also why it is important that you aren�t afraid of a Plan B. The truth is, 50 percent of the time, you�re not going to play the exact pattern you initially intended. It is always important to play the cue ball into areas that give you a couple of options. I always try to play into an area where if I don�t get on one ball, I have a shot at another. Here is an example: Look at the post-break layout in the diagram. The table is open. Pick out the problem areas when determining which suit you intend to shoot. Stripes: The 10 and 9 are both in problem areas. The 11-12-15 lays funny and the 13 is tricky, too. You�d need to play seven perfect shots to get out. Solids: The 7 is tricky, but the rest of the balls connect well, especially with where the 8 is positioned. Once I�ve selected solids, I look at the 8, which really only goes in the open side pocket. What key ball will get me on the 8? The 2 is the obvious key ball, and the 5 should offer good shape for the 2. The 3 and 4 also offer options to get on the 2 if I have to go to Plan B. Now, to break out the 7 ball. Many players would play the 1 and come up underneath the 9, but you could easily get stuck with no shot after hitting the 9. The proper pattern is to start with the 4. Stop the cue ball, then play off the 6 in the side to open up the 7. Speed is crucial here. You don�t want to cover the corner pocket with the 9. Even if you don�t have an open shot at the 7 right away, you are guaranteed a shot at the 1, 5 or 3. That is what I mean by playing the cue ball into an area. It leaves you options instead of playing for one particular ball. Now you can shoot the 1 and play shape for the 3, 4 or 7. Again, options. From there you work your way to a shot on the 5. Just don�t get stuck on the rail, leaving a straight in shot on the 2. Pocket the 2 in the corner and punch up for the 8 in the side. 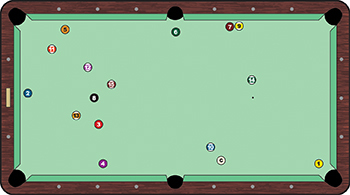 Eight-ball isn�t fun to practice because you�re not swinging the cue ball around two and three rails, but it is a challenging game if you approach it properly.